Most women suffer menstrual irregularities at some point, especially during perimenopause and menopause. While this is natural in many cases, it's important to understand what's natural, and what's cause for concern. Normally, menstrual cycles remain consistent. Their duration may vary between women, but typically lasts between 21 to 35 days, with menstruation between three to five days. Regular is defined as having your periods occur at roughly the same date each month. During certain stages of a woman's life - for example, perimenopause, and puberty - the frequency of periods starts fluctuating considerably, making them extremely difficult or even impossible to keep track of. Another type of menstrual irregularity is known as anovulatory periods. It means the body doesn't properly develop and release a mature egg every month. Understanding why menstrual irregularities occur can help you manage the problem effectively. Hormones like estrogen and progesterone regulate the menstrual cycle by determining when ovulation and menstruation occur. 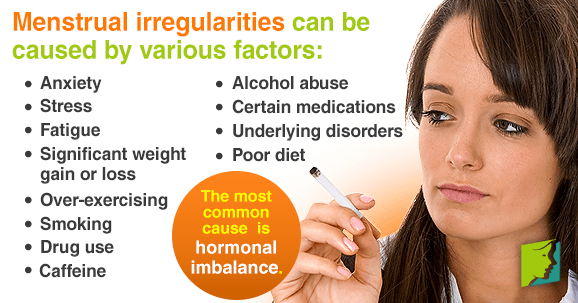 Without a balanced level of these hormones, women are unable to properly ovulate and experience menstrual irregularities. How Can I Manage Menstrual Irregularities? The first step in managing menstrual irregularities, first, try to identify the cause of them. Are you working too hard? Do you feel stressed or anxious? Have you lost or gained a lot of weight? These are all questions you should ask because hormonal imbalance can result from certain lifestyle habits. It may be that you need to relax more by practicing yoga or deep breathing exercises. Take a look at your diet and make sure you get enough nutrients. Regular exercise. This will keep your body healthy and help your hormones stay balanced. Eating healthy. Complex carbohydrates, fruit, and vegetables are all essential to give you all the necessary nutrients and vitamins for proper hormone production. Alternative medicine, like herbal supplements, can help alleviate symptoms. If you are ever concerned about your menstrual irregularities, talk to your doctor. Click on the following link to learn more about the treatments for menstrual irregularities to discover what's best for you.